Offering covermount gifts to your clients are a great marketing strategy to sell more copies. Many companies are already adopting them, giving away mugs, purses or shirts even. World’s leading women magazine; Cosmopolitan have recently released their latest high profile title named Hearst Magazine’s Cosmopolitan! They are adopting covermounts gifts to promote their new series of magazines! Cosmopolitan originates from the United Kingdom and they are the world’s leading magazine for women. They are one of the most recognized magazines on any newsstand. Covermount Gifts – Who wants a pair of sunglasses? 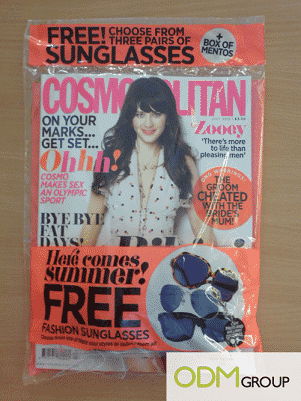 Cosmopolitan is giving away a free pair of sunglasses as covermount gifts. For covermount gifts, the usual method of how it is packaged is basically placing in a transparent plastic sleeve and is mounted on the cover of the magazine with adhesive tape or glue, therefore earning the name of a covermount. Covermount gifts work well because they boost sales in the short-term. Here are some key issues to consider when deciding if this is the right strategy for you. Cost of the covermount gifts? Does it puts the impulse purchase factor on your customers? Does it enhance the value of your product? Does the potential benefits outweigh the costs involved for the covermount gifts? What does the publisher want to achieve through offering covermount gifts to customers? So what are you waiting for? Contact ODM today to help you brainstorm and design a perfect covermount gift for your company! You could also contact us to take a look at recyclable material as another option for the material of your covermount gifts! That way, you can not only increase sales, you can also fulfill your part for corporate social responsibility as well!